Not just common people, even the celebrities fall prey to the ‘overweight’ problem and our Bollywood’s new love ‘Sonakshi Sinha’ is also not an exception. It is not only her, but even Sonam Kapoor, Kareen Kapoor and a lot of other celebrities faced this situation in their career. Luckily, all those celebs has figured a way to lose weight successfully. However, it is a big surprise in Sonakshi Sinha’s case as she lost a whooping 30 kgs before making her debut in the Bollywood movies. She also tried to lose a few more pounds recently after acting in a few blockbusters. If you compare the current Sonakshi to the Dabangg time, she is 10 kgs lighter now. She just started looking gorgeous with more curves added to enhance her beauty. She is trying diet, yoga, workouts and everything possible to look fab onscreen. 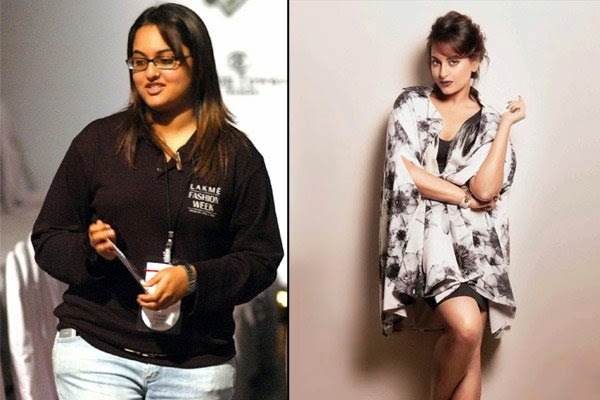 So, I thought of publishing the weight loss success story of Sonakshi Sinha with full details like her daily meal plans, workouts, and other lifestyle changes. 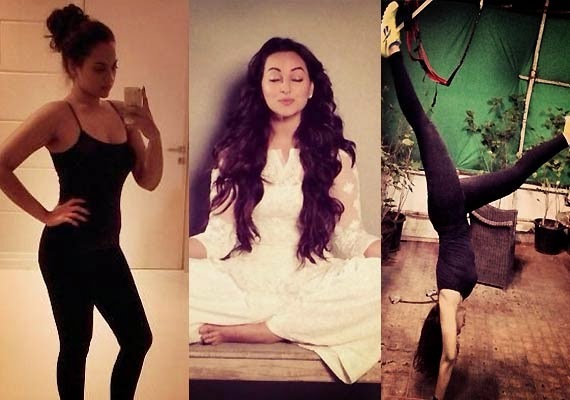 Sonakshi Sinha follows a particular lifestyle which is a combination of diet and exercise. Being a big foodie, it is very difficult to stay away from fatty foods. But, this dazzling girl has managed to avoid all kinds of junk foods, processed foods and other foods that are unhealthy. She included high protein, low carb foods in her diet. Along with the food selection, she also changed her eating time periods from 3 large meals a day to 5 small meals a day. Her most favorite drink now would be the Green Tea, which she consumes twice or thrice in a day. Since diet alone can’t help us lose weight successfully, Sonakshi incorporates a strict workout routine into her lifestyle to stay fit. In the starting days of her weight loss journey, she used to suffer a lot of aches and pains. But, she didn’t lose her dedication and now she never misses out a chance to exercise. Sonakshi’s workout regime consists of strength training along with cardio workouts for 3 days and yoga exercises for the rest 2 days. She practices ‘Bikram Yoga‘, a yoga form that is performed in a hot room with at least 40 degrees Celsius. Since the impact of this yoga form is pretty high, it burns several pounds with just 25 minutes of the yoga (your body will sweat immensely). On selected days, she spends some time playing her favorite sport ‘Tennis’, which is a great form of physical activity. Let us look into her time to time activities for the whole day. Early Morning: She wakes up early in the morning and do weight loss training for at least an hour. She does it for 3 days in a week. During the remaining days, she practices hot yoga to keep her mind and body relaxed. Breakfast: She will have cereal with milk or whole wheat toast for the morning breakfast. Sometimes, she munches on the corn as they’re rich in proteins and carbs, as well as fill the stomach easily. Mid-Morning: Sonakshi munches on the dry fruits and also sips a cup of Green tea, which is good for weight loss and also works as a beauty enhancer. Lunch: The Dabangg girl’s lunch consists of homemade roti and sabzi. Along with these, Sonakshi also eat fresh vegetable salad, which aids in weight loss. Evening: She mostly prefers to have a small bowl of fruits (multiple varieties), but sometimes she only takes a cup of Green tea. Dinner: Sonakshi Sinha always says that it is necessary to eat at least 3 to 4 hours before going to sleep for easy digestion. So, she eats rice, dal, sabzi and vegetable salaad for dinner. Along with these habits, Sonakshi insists to drink at least 3 to 5 liters of water every day as it will boost our immune system and keeps us active. Not just that, drinking water also helps curb appetite. That is Sonakshi for you friends! If you’re looking to lose weight like her, then try to follow a strict lifestyle that consists of a healthy diet and strength training for best results.